Every election cycle Democrats look for signs that the Hispanic vote is going to reach the breakout stage. And every election cycle it doesn’t happen. Political consultant Marc Campos sent out the figures for the major Hispanic precincts in the mayoral runoff. His commentary: Every H-Town Latino political player ought to be embarrassed at the low Latino voter turnout in last Saturday’s run-off. I know I am. Many Latino precincts turned out in single digits. I don’t want to hear excuses like the mayoral campaigns didn’t direct resources so our folks didn’t show up or we didn’t care. We can obviously do a lot better. In the meantime, mull over the following: Click here for a link to the precinct-by-precinct turnout chart. The first seven precincts are traditional Second Ward, Magnolia, and Denver Harbor neighborhoods. The last two are Northside neighborhoods. 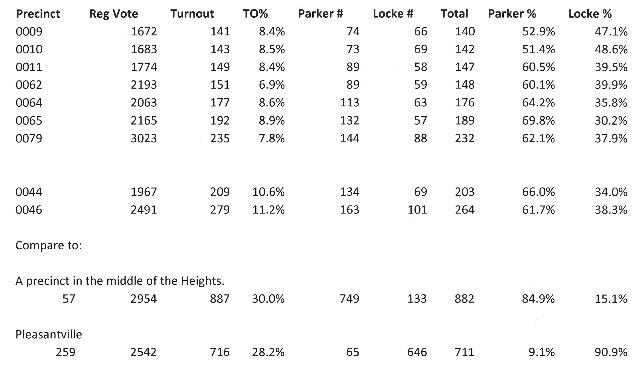 Notice the higher turnout % in the Northside because there was a Latina HISD candidate. [The turnout in these two neighborhoods was slightly more than 10% and 11%, respectively.] The lowest turnout of any precinct in East Side barrio neighborhoods was 7.8%. The highest turnout of any precinct in the East Side barrio neighborhoods was 8.9% A typical precinct in the Heights had a 30% turnout. A typical precinct in Pleasantville had a 28.2% turnout. This is not good news for Democrats.